De Queen’s Esmeralda Balderas heads the ball back to Nashville’s end of the field as Yatzari Dominguez looks on. 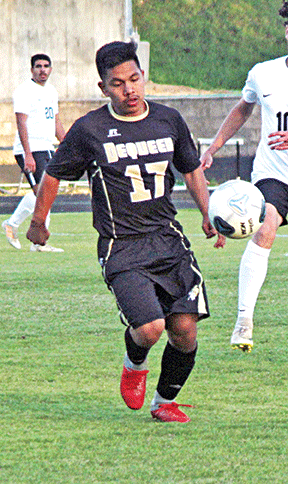 Adolpho Ortiz of De Queen blocks a Nashville pass. 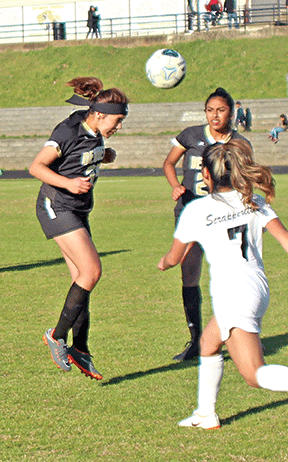 The Lady Leopards posted a 6-0 shutout after a close first half. Sara Victoriano got a shot 148 seconds into the game but missed high. A minute later Jooana Guerrero was on target, but her kick was caught by the Nashville goalie. The visitors had a chance to take the lead, but missed a free kick from the 22-24 yard range with 12:10 left in the first half. The Lady Leopards scored 81 seconds later. Victoriano dribbled from near midfield, then connected on a short straight ahead shot from about 12 feet out. The score stayed at 1-0 until 5:12 remained on the first half clock when Victoriano curved in a corner kick from the right side for De Queen’s second goal. De Queen had possession to start the second half. Victoriano made a shot out of a crowd at the top of the box 48 seconds into the period to make it 3-0. Nashville visibly sagged at that point. The defense kept the visitors well away from scoring. The Lady Leopards continued to get the ball to Victoriano. She scored again with 33:22 to play when she drilled a kick that bounced off the goalie and a defender into the net. Thirty seconds later Victoriano put a chip shot in for a 5-0 lead. The mercy rule came into effect with 22:11 left when Steffi Rojas scored off a corner kick to make it 6-0. De Queen attempted 26 shots in the contest. Abby Ponce had a dozen stops for De Queen. Guerrero and Natalie Martinez each recorded an assist for the Lady Leopards. Nashville avoided a shutout with a last minute goal in the boys game won by De Queen 4-1. The Leopards took the lead when Jason Huesca sent a shot that skimmed the grass into the net from the top of the box with 26:31 left in the first half. Estaban Gardea found the net from eight yards out with an assist by Alex Ramirez with 5:43 in the half for a two goal lead. The score remained at 2-0 well into the second half. Edward Garcia fielded a Nashville shot and sent the ball to the other end with a booming kick. As the teams fought for possession, Huesca spun and drove the ball home from five yards. The score went to 3-0 with 21:33 in the second half. Jose Martinez got the final De Queen goal from far away. He took a pass from Melvin Cerda and hit a 30 yard kick with 8:27 to go.